During the winter I love the excuse to make random things and try new crafts. My sewing machine has gotten a ton of use the past few weeks and the dogs are getting pretty sick of the racket so I decided to try something new. I have always loved intricate processes and the insanely ridiculous easter eggs from the Ukraine have always impressed the crap out of me. The art of Pysanky loosely translated means; “overly complicated, absurdly involved way to color eggs. That we know how to do and you don’t. Nanner nanner, nanner” (said while making an “L” shape with fingers on forehead and tongue out.) Well, I took that as a challenge no one ever intended to extend. After a quick trip to Amazon and $24 later I waited impatiently for my kit to come. In the meantime and confirming I am my father’s daughter, I jerry-rigged my own Kristka. True to form and never having seen the tool in person I royally screwed it up. After a few REALLY primitive looking etchings (etching is when you use vinegar to dissolve the shell enamel, leaving any spot not covered in wax the original color of the egg) my kit finally arrived! The patterns online were daunting but I’m stubborn and so the adventure began. I looked into the history of the this tedious tradition and found that the while a basket of colored eggs in the home had been a pagan tradition for centuries the modern art of Pysanky was developed largely in the Ukraine by farmers. 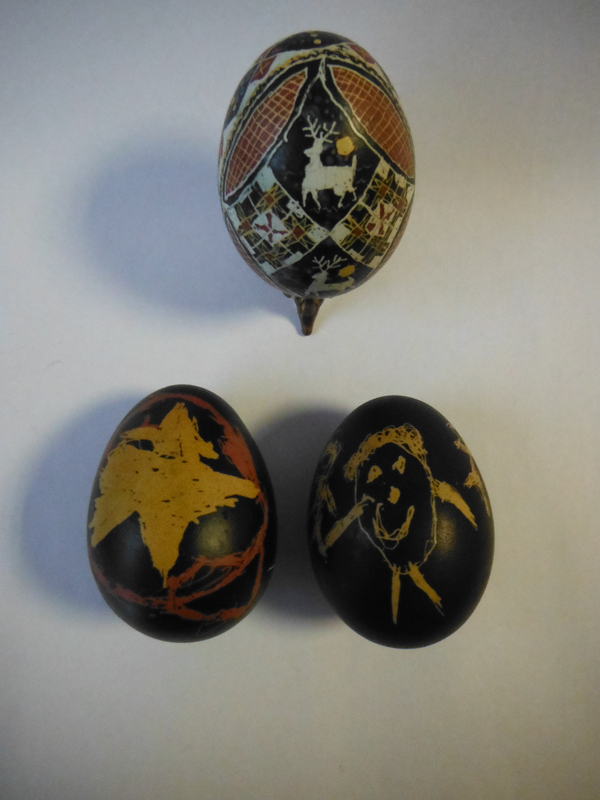 Many of the symbols used on the eggs have specific meanings that have been adapted to Christian beliefs. I was pleasantly surprised to have it referenced that if a farmer had a bee hive an egg was to be placed under the hive for good its good health. 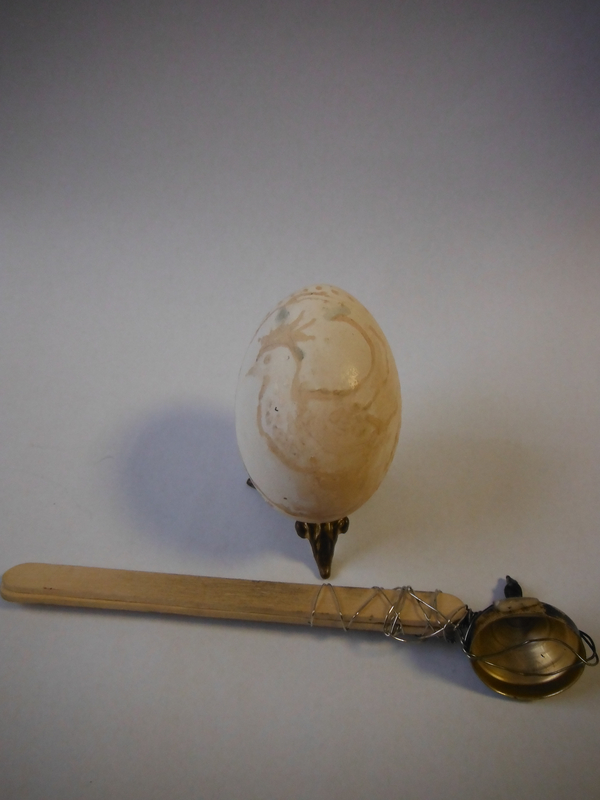 There was even mentioned that if a person was really ill an egg was to be worn around their neck…I don’t think I will be trying that one. 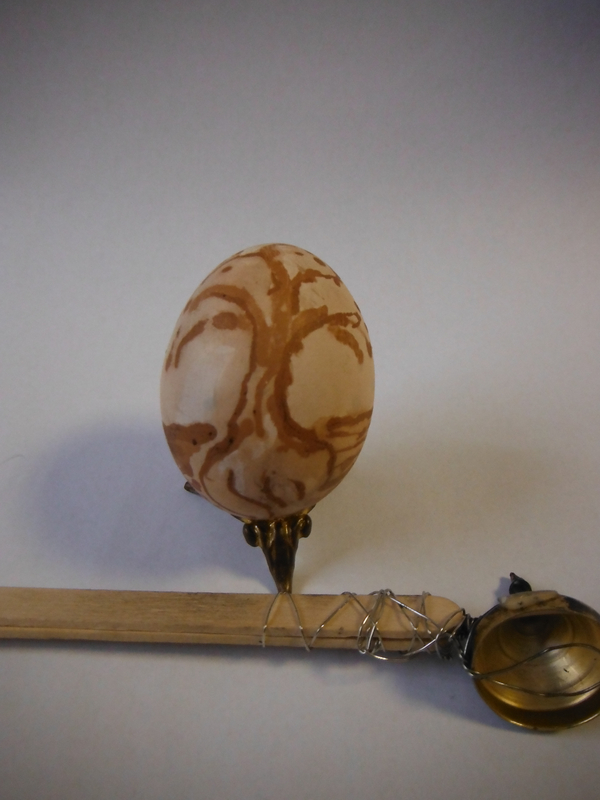 Traditionally the eggs were done by the women of the household and only after a day of refection and purification, they were to be done at night when the kids were in bed and the designs are meant to be a secret surprise for the rest of the home. 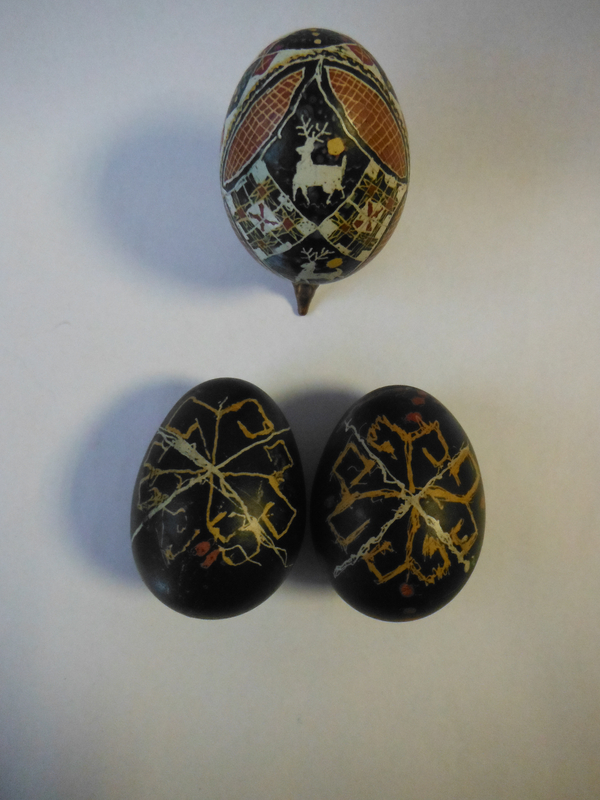 The dyes were held in special clay pots, they were to be made with fertile eggs (check and double check.) This was a spiritual expression not social hour craft time. I followed exactly none of these traditions, with the exception of the fertile eggs as I’m pretty sure the coop itself is pregnant at this point. Since you layer the wax on top of each color in succession eventually you end up with an egg that is black by the end of the process. The really cool part comes when you warm up the wax and wipe it off. This was one of the simplest patterns online. I think they killed it! Such detail. Kids no doubt love this craft. So cool.